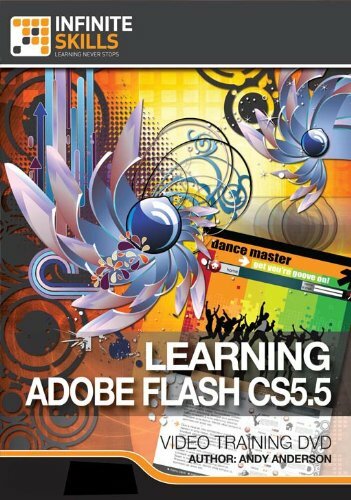 In this Adobe Flash CS5.5 Training Video, expert author Andy Anderson explains the ins and outs of using this powerful animation and video creation program. Adobe Flash has become a web standard for animations, video and even gaming. In this training video, Andy introduces you to the basics of Flash, preparing you to utilize it in many different fashions, including a review of the new features for the 5.5 update to the CS5 suite. Andy starts with an introduction to the new features available in CS5.5, including asset sharing with projects, converting vector images to bitmap, publishing to iOS devices and much more. You will then get into the basics of creating your Flash documents and projects, this video tutorial covers topics ranging from working with text, graphics, animation and video. You will learn how to work within the Flash timeline, utilize layers, create shapes and use the pen and other drawing tools. You will be taught how to import graphics, save symbols to the library, work with masks, and even introduce audio into your Flash documents. Andy teaches you using a unique combination of humor and instruction, which is extremely effective in allowing you to retain what you are taught. By the conclusion of this computer based training video, you will have all the necessary skills to create your own flash movies, animations and web documents or even full websites! Andy has included working files to allow you to use the exact same files he is using, increasing your ability to replicate the examples and learn Flash at your own pace.